HISTORY, the #1 Specialty Entertainment Network*, announced start of production on the new Canadian original docu-series,　Bud Dynasty　(7×30). The series　follows intrepid entrepreneurs as they navigate Canada’s thriving and controversial marijuana industry at a time when the dubious plant is emerging from the shadows of prohibition and into the grow lights of legalization. Bud Dynasty　chronicles this burgeoning green rush by following Canada’s most charismatic and uncompromising marijuana trailblazers who risk it all and bravely face serious obstacles in this uncharted territory. Pot pioneer Bob Kay is a burly biker and father of four who dreams of franchising on a massive scale, but also recognizes the volatility of the business. As Bob seeks out investment opportunities, he turns to Joe Le, a young entrepreneur and dispensary owner from Vancouver. Joe is making his mark on the cannabis industry and is intrigued by the possibilities of partnering with Bob and capitalizing on his grow license – which happens to be one of the largest in Canada. However, the competition is fierce as franchise operators, large-scale growers, licensed producers, publicly traded companies, and other dispensaries each battle for a slice of the market and control over supply, distribution, and retail sales – all while facing local officials threatening to shut down all retail sales until regulations are in place. Bud Dynasty　provides an all-access look into the frontier of the legalized pot business, its big players, the obstacles they face, and the epic journey of building a groundbreaking industry from the leaf up. 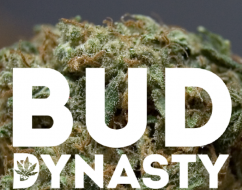 Bud Dynasty is produced in partnership with Screen Siren Pictures, in association with HISTORY.